The project required careful planning and coordination among Saint Joseph's University's athletic department, facilities department, media and informational technology departments, the project architects and the builder. All provided input regarding the previous conditions and what they wanted to see in Hagan Arena. "One of the goals for the development of the audio system was that all fans, regardless of where they were seated, would have clear and intelligible sound at a level that energized the emotion of the event," said Rich Coluzzi, president of RJC Designs Inc., the consultant for the project. Coluzzi explained how he had used Community Professional's loudspeakers before and knew the sound quality, engineering and attention to detail they offered. Neil Thompson Shade, an acoustical consultant for RJC Designs, provided acoustical layouts and coordination with the products selected for the new arena. The loudspeaker selection and their placement were critical for the application. The design team opted to use Community's Solutions Series, which is ideal for challenging environments like a loud basketball arena packed with students. After several discussions and modeling reviews, Coluzzi said. The Michael J. Hagan Arena debuted in November 2009 as the home of the Saint Joseph's University men's and women's basketball teams. 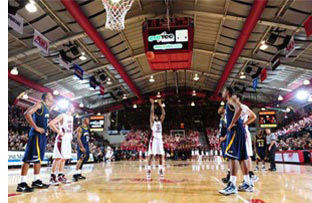 Located on the school's campus in Philadelphia, Pennsylvania, the arena underwent significant renovations to increase its size and capacity. Previously named the Alumni Memorial Fieldhouse, the facility originally opened in November 1949. The Saint Joseph's Hawks have a rich basketball tradition. The men's team had a strong track record in the old building, winning 80 percent of its games there. Hagan Arena added 1,000 seats and now accommodates 4,200 fans for basketball games. The facility also now features premium seating, new concourse areas, upgraded concessions and a new basketball court. The team decided that a distributed cluster configuration using Community's SLS920 loudspeakers and VLF212BI subwoofers would cover both the arena's new and existing areas. They also used the versatile iBOX i2W8, which made a perfect fit for the upper end zone seating. Engineer Mike Parry of Vistacom, the project's contractor, said the final result was excellent intelligibility and great fidelity. "The distributed audio clusters and the bleacher systems were all engineered within a zoned approach," said Coluzzi. "Utilizing DSP processing allowed for complete control of the upper and lower portions of the clusters, the subs for each cluster, over-the-court loudspeakers, and the loudspeakers in the upper end-zone bleacher areas. Having this flexibility in equalization, delay settings, and loudspeakers output levels allowed for even coverage from seat to seat while presenting a central audio focus towards the court." The initial feedback on the system was outstanding. After Saint Joseph's first men's basketball game on November 13, their coach Phil Martelli had great things to say. "Whoever did the sound system should be applauded, because that sound system was extraordinary." 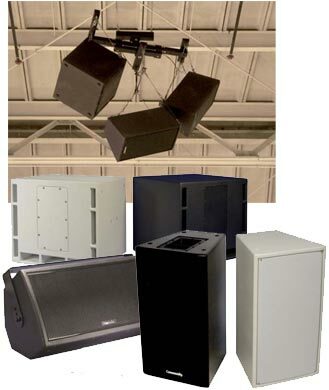 The horn-loaded, Solutions Series loudspeakers offer system designers the tools to meet speech and music sound reinforcement requirements in challenging acoustical environments. The Solutions Series products excel in a wide range of applications including sports venues, houses of worship, theatres, auditoriums, dance clubs and portable rental systems. The Community Solutions SLS920 loudspeaker is a unique problem solver. In the most difficult acoustical environments such as unusually reverberant gymnasiums and basketball arenas, the SLS920 provides focused and high intelligibility voice projection and musical reinforcement. The SLS920 is a horn-loaded, three-way, full range loudspeaker system with an integral one-piece fiberglass baffle of Wavefront CoherentTM design, offering very high output and high sensitivity. The VLF212 is a dual 12-inch, no-grille design with slot-loaded woofers for extended low frequency response. The i2W8 is a full-range, two-way device employing a pair of eight-inch carbon fiber, ferrofluid-cooled, low frequency transducers and a high frequency titanium driver with a one-inch exit. Centrally mounted in a "Super-V" configuration on a pattern control horn offering ultra-wide 120° horizontal coverage.